The KUBICLUB is an original and contemporary marquee. Its cubic and sober shape differentiates it without omitting its main function: to offer you a space protected from the rain and the sun. The micro perforated canvases are fully printable with a display of your own. The KUBICLUB is designed not to have poles at the corners to allow greater freedom of movement thanks to its PVC straps. Its aluminum structure gives it a light appearance while guaranteeing its strength and durability. 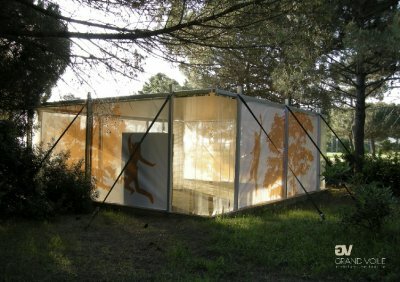 The rainwater flows on its waterproof cover sheet and escapes into a translucent central impluvium. Canvas made of polyester coated PVC, 700g / m fire-resistant M2. Tensile strength 260daN / 5cm. Side curtains in micro perforated fabric printable, fire resistance M2. PVC strips, fire resistance M2. Screws and stainless steel plates. Impluvium in PVC. Class IV treated autoclave pine floor. Grand Voile is specialized in the design and manufacture of textile architecture.